“What does maths have to do with learning English?” you might ask. Many people believe that nothing. In fact many wrongly believe that you can be good either at maths or at English. However, I think that mathematics and English have more in common than it might seem at the first sight. To be good at both of them you have to practise a lot. And to be able to solve the mathematical problem you have to understand it. And to understand the mathematics you need to understand the English first. Thus English and algebra have a lot in common. As I write above, to get to the algebra you need to understand the English first. Learn the following vocabulary using the mind map. All the words are explained and demonstrated. Print out the mind map and write the translation of the words into the empty boxes. 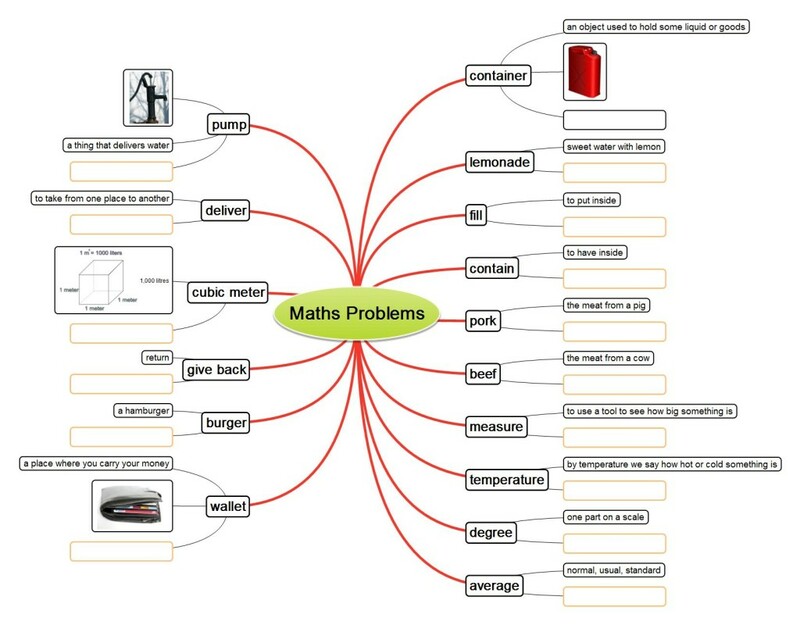 Now it is time to practise the vocabulary you have learnt in the mind map. If you pass the vocabulary quiz you can play the game Tic_Tac_Toe. Both of the activities are in HTML 5 so you can try them out on your mobile phone or tablet. There is just one way to win the Tic Tac Toe game. Can you find it? Good luck. Now that you know all the vocabulary it is the time for the algebra. Can you solve these problems? 1. There is a big container full of lemonade. You can fill 114 bottles from this container. Each of these contains 0.7 litre. How many 0.3 litre bottles can you fill from the same container? 2. A restaurant bought 6.4 kilogrammes of pork, 3.5 kilogrammes of beef and 4.2 kilogrammes of ham. One kilo of pork costs 123 crowns, one kilo of beef costs 245 crowns, and one kilo of ham costs 156 crowns. How much did the restaurant pay? 3. Peter measured temperature during the day. He measured these temperatures: -2.0 degrees Celsius, 0.1 degrees Celsius, 3.4 degrees Celsius, 3.9 degrees Celsius, 0.5 degrees Celsius, -1.7 degrees Celsius and -3.5 degrees Celsius. What was the average temperature? 4. A pump delivers 50 litres per minute. How long will it take till a 10.2 cubic meter pool becomes full? 5. When James went to school he had $28.75 in his wallet. His friend gave him back $12.84. He then bought a burger for $3.86 and two books for $9.30. In the evening his father gave him $2.70 and he returned $5.00 to his mother. How much money did he have at the end of the day? Did he have more or less money and by how much? Here you can see the graphical explanation how to solve the mathematical problems. Still not sure whether you have counted correctly? Insert your answers into the following quiz and see how many answers you got correct. If you manage to solve 4 or five problems you can play the game Angry Finches. Good luck. Thank you. If you would like to share any of your materials, I will be happy to do it. I’m an English teacher. I am from Indonesia. I agree with you. sometimes it is a bit hard to teach English and math for the students whose mother tongue is not English. I search that you got your own site. May I know your email address? So that I can ask you about Italian. I really fond of Italian and I want to learn Italian. Hello Yassin from Algeria I want to learn mathematics in English Thank you. It’s really good for English and maths.. I am not Italian 🙂 I am from the Czech Republic. Sorry. In the Czech Republic we use commas too but in English they use dots (they call them point).